Ed and I celebrated part of the year-end holidays in Mendoza, in the heart of Argentina's wine-producing region, doing some serious wine tasting when we weren't hiking in the Andes. We stayed at the beautiful Cavas Wine Lodge, overlooknig 35 acres of vines at the foot of the magnificent, snow-capped Andes. At Cavas we had a wonderful Christmas eve dinner with the gracious owners of Cavas, Cecilia Diaz Chuit and Martin Rigal. 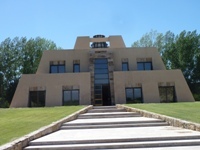 Our favorite wineries we visited were Vino Cabos, of which Sonoma winemaker Paul Hobbs is part owner, and Catena Zapata, which is housed in an amazing replica of a Mayan pyramid (picture). Our favorite wine at Catena was the 2012 Catena Alta Chardonnay. Hiking the Andes was surely an experience with our guide Francisco. We had a picnic lunch in the middle of a clearing with horses looking on.